Burger served with guava jelly, melted Gruyere, stuffed with potato stix, crispy bacon, LoKal sauce and then pressed on a flat top grill. Are you drooling yet? You should be! I was inspired by this burger to make my own – albeit less decadent – burger. We had some Bubba burgers left over from a family barbecue, brie cheese left over from another recipe, & guava paste because I’m Cuban & it’s a staple in my house. Bingo. If this combination sounds weird to you, just know that guava & cheese is a CLASSIC in the Hispanic community. I cut up the brie & guava paste to melt over the pre-cooked patty. To complete this beautiful burger I turned to another classic Hispanic pairing – mayoketchu. As the name suggests, it’s equal parts mayonnaise & ketchup. It’s also surprisingly tasty to someone who hates ketchup (me). Put it all together on a bun & you have an wonderfully Hispanic Hamburger. I’m not the greatest at taking pictures of sandwiches/burger, but that still looks pretty great to me! Place hamburger in a pan with sliced guava paste & brie on top. Cover with lid & heat until cheese is melted.Place on bun with mayoketchu. Last week I shared part 1 of this steak extravaganza. 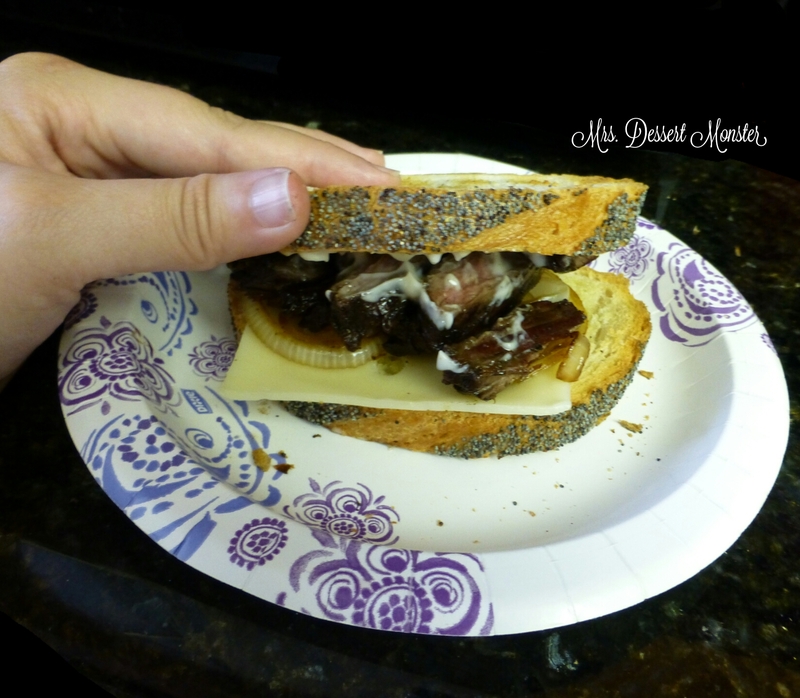 Today I bring you part 2: skirt steak sandwiches! My photography skills didn’t quite capture that, but trust me! How are you even supposed to take pictures of sandwiches that capture all of the goodness? With just a little bit of prep, I turned leftovers into haute cuisine. You know, the paper plate kind. The secret ingredient in this recipe is Arby’s Horsey Sauce – which is a horseradish mayo. It was such a great contrast to the sweet balsamic steak. Add some cheese & sauteed onions to buttery Italian bread & you’ve got a gourmet sandwich! Thinly slice the onion & sautee with a little olive oil. Thinly slice the skirt steak. When onions are almost done, add skirt steak to pan to thoroughly reheat. Toast the sliced Italian bread & add butter. Spread Arby’s Horsey Sauce on one of the slices of bread. Use 1 packet per sandwich. Assemble the sandwich: steak, onions, swiss cheese. We hadn’t even moved into our house yet when he was already planning all these barbecues & football parties he wanted to throw. My dad was sweet enough to surprise us with a grill as a house warming present. We came home from church one day & there was a grill in our backyard! Since then, we have used it for many family dinners. Sometimes we use the grill for just the two of us. It’s usually to make steak. I’m so glad I married a man who loves steak beef as much as I do. I literally majored in it! 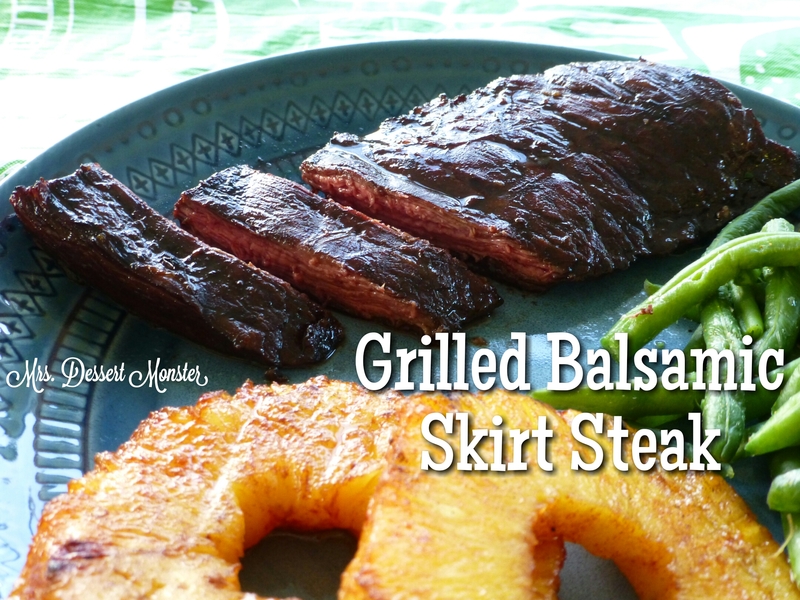 Even though I am familiar with skirt steak that way, I had never actually prepared it myself. I was looking through recipes & came across a good one on MyRecipes.com. The balsamic vinegar & Worcestershire sauce combo caught my eye immediately. I tweaked the recipe a little bit – like I usually do! 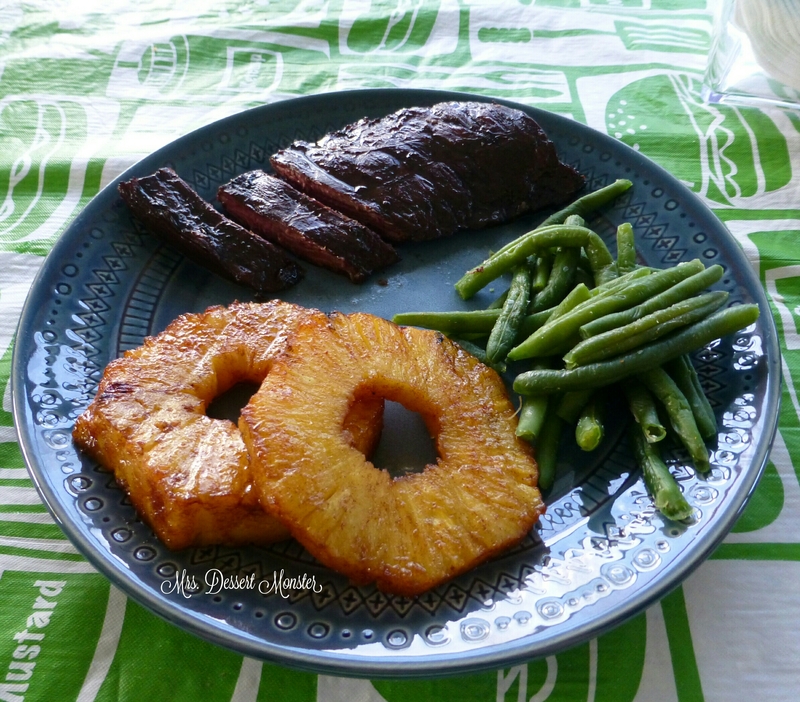 While the steak was marinating, I cut up a fresh pineapple to be grilled alongside it. I had some cinnamon sugar left from the monkey bread muffins I made, so I sprinkled it on the pineapple. 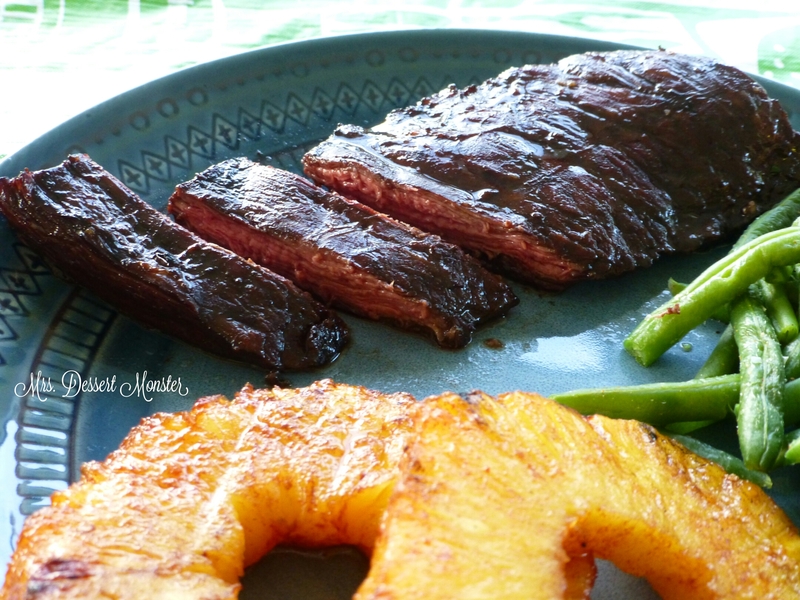 Mmm, steak & grilled pineapple – it was like going out to a fancy steak house! Actually, it was better than going to a fancy steak house! I love teamwork dinners like this. My husband & I get to hang out in the kitchen & enjoy something delicious together in the end. He’s the best partner. Since this was just for the 2 of us & the skirt steak was cut into 4 pieces, this was just ONE of the awesome dinners we had with it. 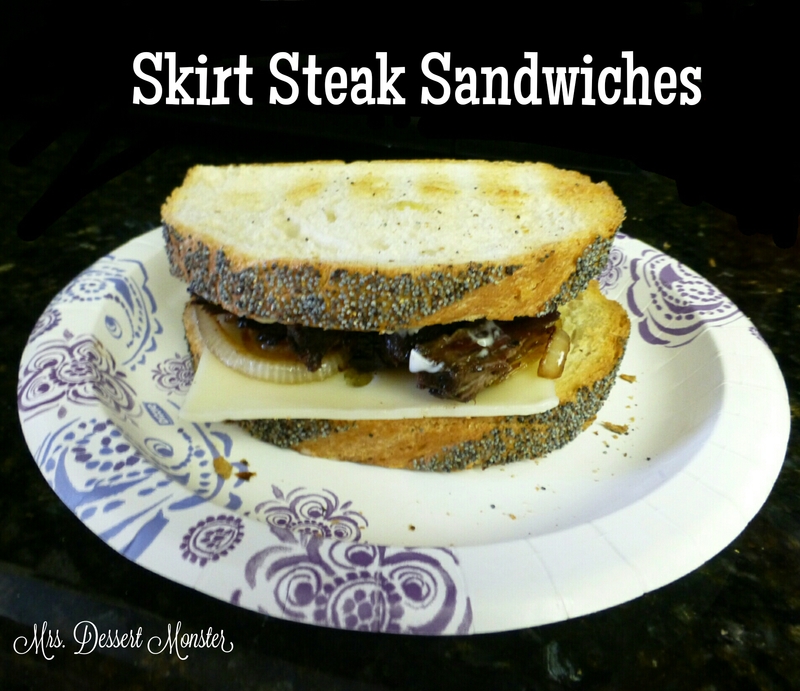 The next day I made delicious skirt steak sandwiches! Combine first 4 ingredients in a large ziplock bag. Add steak & marinate at room temperature for at least 25 minutes, turning once. Remove steak from bag; discard marinade. Fire up the grill & cook steak 3 minutes on each side or until desired doneness. Let steak rest for 5 minutes before cutting diagonally across the grain into thin slices. Life is busy. Like, really busy. Time is flying by. One of the reasons that time seems even more fleeting for me lately is the fact that I don’t like to consider my job as part of my life. When you factor everything in, I am away from home because of work for 50+ hours a week. What do I mean, then? Well, those 50+ hours a week are so that I can have a paycheck to provide for ‘my life’. I don’t love what I do. It’s not totally my job’s fault, though. I realized in college that I am never going to be a career oriented person. I am a family oriented person. I am a people oriented person. I love being close to my family. I love seeing my friends often. I love being around babies & kids. I love hosting dinners & parties & making food for people. I love going to church & being involved in several different ministries. Not everyone enjoys all those things. Some people are more introverted & require plenty of chill time to recharge. Some people are extroverted, but not too fond of hosting or cooking. Or, they aren’t fond of children. Some people don’t get along with their families as well as I do. Some people haven’t found a church they call home, or choose not to go to church at all. Some people love their jobs/careers & get their blood pumping by working really hard to achieve success in their field. I cannot relate. Don’t get me wrong, I am a hard worker. It’s just not something I love. If I’m being really honest, of course work is a part of my life. I would just rather be doing other things. I know that even people who love their jobs feel like this at times, I just find myself counting the minutes more than most. I look forward to one day being a stay at home mom. That job will be a lot harder than the one I am doing now, but I think it will be a lot more fulfilling to my personality. I’m several years away from that, so for now I suppose I will keep showing up to work Monday-Friday. Because work takes up so much of my time, I cherish the nights I get to host a meal & hang out with people during the week. Life (including work) gets really busy, but that doesn’t mean we can’t carve out some time for people. The weekend is too short to do everything I want to do & see everyone I want to see. To feed extra people, I’ve started stocking up on quick/easy ingredients. For example, when pork roast is on sale, I’ll buy one & freeze it until the day my husband & I can share with someone else. I buy meat on BOGO & just freeze them until we use them. I also try to buy certain things in bulk. Ground beef is one of those things. Y’all might already know that my husband & I are totally beef people. I bought a 2lb pack of ground beef a few weeks ago & just split it to several smaller portions in Tupperware before freezing. So far we’ve made burgers & taco salad with it. Last night, it was shepherd’s pie. 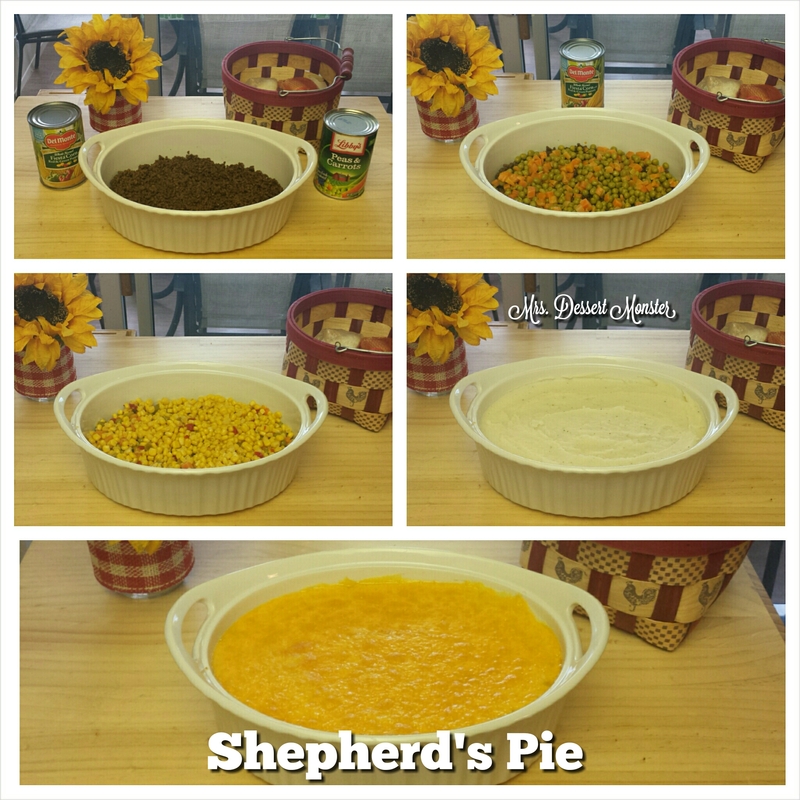 Shepherd’s pie always has plenty of servings, depending on how much you make. Sometimes I make it just for me & hubby; we take the left overs as lunch the next day. This is a recipe that I almost always have ingredients for. It’s perfect for busy nights. There are some recipes that call for lots of prep & fresh ingredients – this is not one of them. Box mash potatoes + canned (or frozen) veggies = quick & easy dinner. Throw in some ground beef & some cheese & you’re all set. This one-dish meal is perfect for busy nights, which occur more often than not. It makes weeknight activities all the easier. My brother & my niece came over just in time for dinner. It was great seeing them! Gotta run – busy, busy! I leave you with this photo collage. I was going to include the recipe, but I realized that I kind of just wing it every time I make this. Don’t get too hung up on recipes. Put whatever kind of corn (I used southwest style) & whatever other veggies (I used canned peas & carrots) you’d like! Season the beef whatever way you want; I always use Worcestershire sauce. Get mashed potatoes whatever way you can – homemade, store bought, instant, leftover, etc! Throw some cheese on top (I used cheddar, but you catch my drift) & broil it until it looks good to you. Our friends David & Beth got us a super fancy crock pot as a wedding present. There’s a bit of a back story. First of all, I had never even used a crock pot until I moved in with my husband. It’s just not a very Cuban appliance. 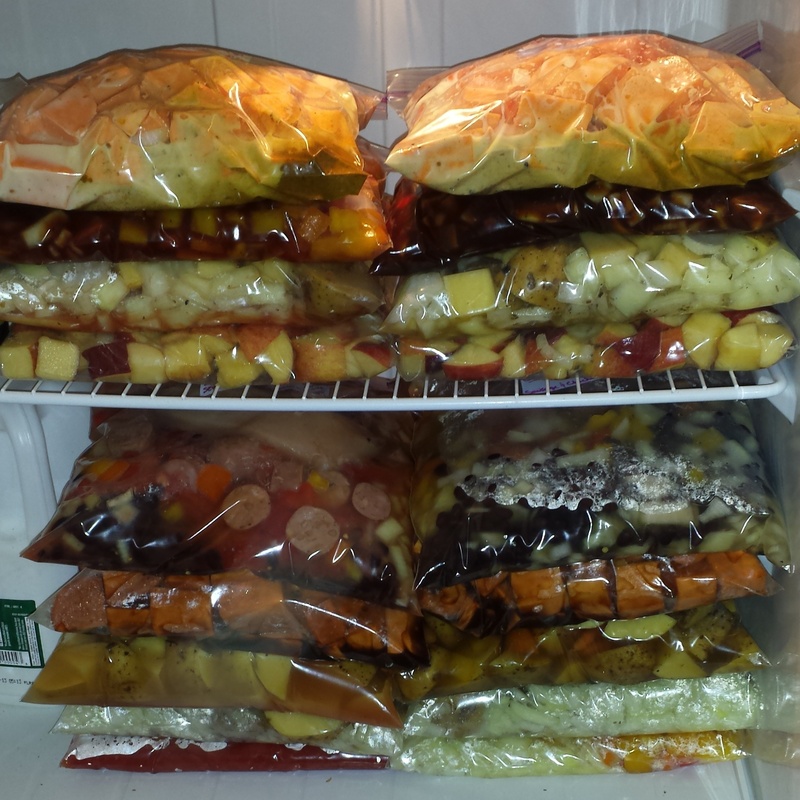 Then, last November Beth & I made 20 crock pot freezer meals. We spent a whole afternoon chopping & prepping. Since then we’ve had sort of this inside joke about crock pots. The thing is that while some of these meals were good, others were not so great. I think the ingredients just don’t always freeze well, & if you leave them in the crock pot all day they can get mushy. Plus, one day I forgot to thaw one the night before so I got the brilliant really, really dumb idea to cut the frozen block into smaller chunks to fit in the small crock pot we had before this fancy one. With a serrated knife. All before I had coffee in the morning (I blame that). 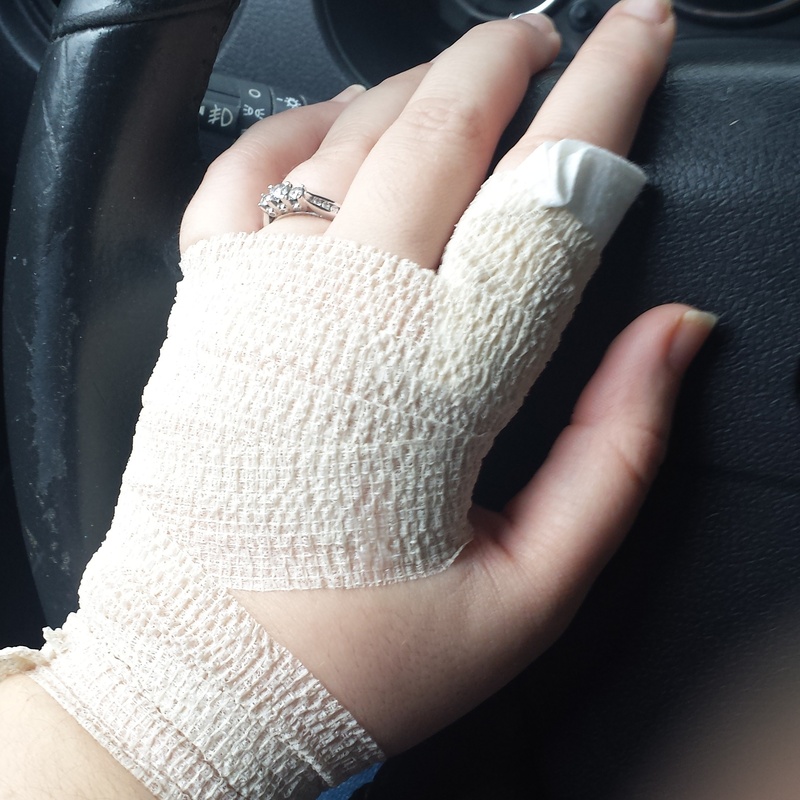 That, kids, is how I got the scar on my left hand 3 weeks before my wedding. Not the best morning I ever had. Anyway, our new crock pot is awesome. It’s got a few different settings (our old one just had high/low) & the lid locks for easy transport. My favorite setting is the one for 10 hours. I think that was part of the problem with the last set of freezer meals- the fact that from the time I leave my house in the morning to the time I get back is usually 10 hours & the ‘low’ setting on our old crock pot was really meant for 8. Our new one switched automatically to keep warm after the time you set. Beth, have I said thank you enough? So I was looking online for crock pot recipes for Eye of Round Steak. My husband and I are total beef people. I even got a degree in it! Seriously. Though I don’t work in agriculture currently, my B.S. 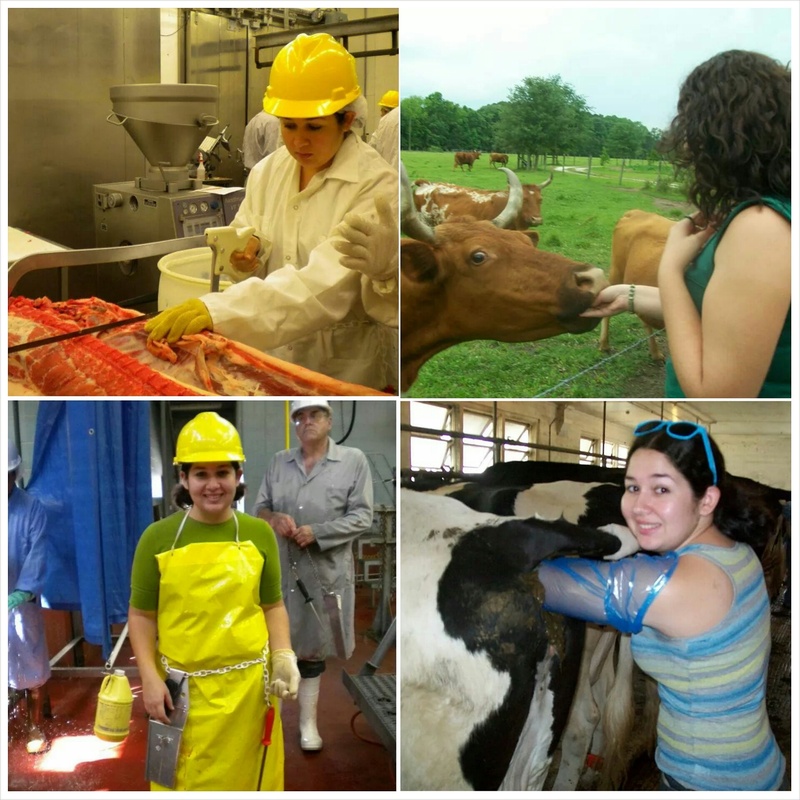 is in Animal Science – Beef Industries. I like to tell people I studied cows in college. So being beef people, we look for ways to eat more beef! Last week we bought some Eye of Round on sale. In my search for crock pot recipes, I decided I could probably come up with my own. A) I didn’t have all of the ingredients necessary to make some of the recipes I was looking at, B) how hard could it be? I chopped up the fresh stuff & set out my seasonings Monday night. Tuesday morning I put the frozen steak, fresh veggies, & seasonings in the crock pot with a little butter & water. I apologize for the lack of pretty pictures of the finished product. We didn’t get around to eating this until after hand bell practice at church – almost 10PM that night! Which is like 14+ hours in the crock pot (I checked it & tasted it after 10 – right before dashing to practice). And it came out delicious. We were STARVING, & devoured the whole thing! When I make it again, which shouldn’t be too long because we really liked it, I’ll be sure to take some pictures! Chop up the potatoes, onions, & carrots (if necessary). 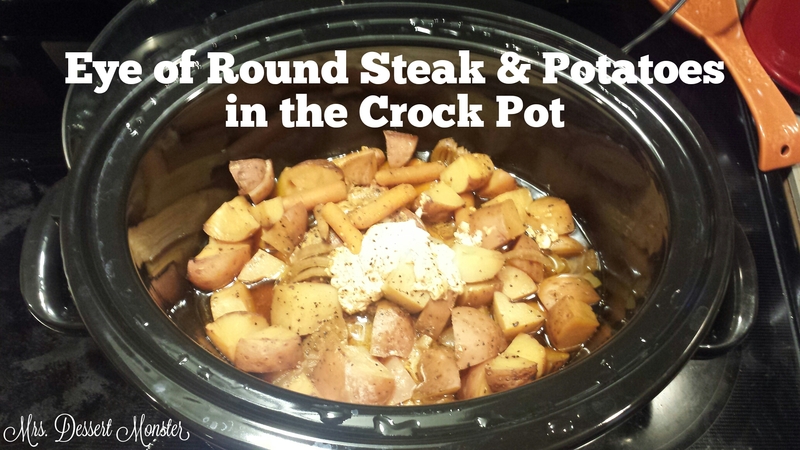 Add frozen steak to crock pot with all other ingredients. Cook for 10 hours on low. Stir up to shred the steak. There’s not a whole lot to this recipe; the Worcestershire sauce is really what makes it in my opinion. I love it because it’s not exactly like a stew; it’s meat and potatoes. I’d experiment with adding different veggies, more meat if I want, maybe a little cayenne pepper for spice, etc!